Welcome to the sixth issue of WHOOSH! The Journal of the INTERNATIONAL ASSOCIATION OF XENA STUDIES (IAXS). Chairperson, IAXS BA History 1980. MA Music 1984. JD 1991. When not busy with various Xena or Star Trek activities, Kym practices law for the federal government in the Central Valley in California. She is currently serving appointed terms on the Hearing Board for the San Joaquin Valley Unified Air Pollution Control District; the Greater Bakersfield Legal Aid Society; and the organization Advancement and Improvement of Minorities (AIM) for government employees. Other than being an insomniac, Kym was the founder and first Chairperson of the Board for IAXS. In her free time, Kym also edits RESISTANCE IS FUTILE, a Star Trek parody newsletter; XENA MEDIA REVIEW, a XWP world press review; and THIS WEEK IN XENA NEWS, a bibliography of XWP news articles. Kym is 38 and lives in Bakersfield, CA with Wes, her tolerant husband of ten years, and Ira, her patient nine year-old son. 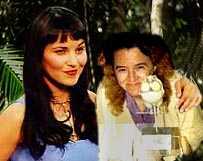 Both her and Ira each have their own five-inch Xena action figure. Vice Chairperson, IAXS Betsy Book is a newly-employed Web Production Assistant for iVillage, a Silicon Alley start-up. Her hobbies include reading, watching television, and organizing large Xenafests for her fellow crazed Xenites. She would like to congratulate Tom on finding a new apartment in New York City (one of the hardest things a human being can undertake) and would like to thank both Tom and Bret for their help with the technical mumbo-jumbo for Issue 6. "So You Want to Be a TEDite?" "Bacchae and the Successful Mixing of Traditional and Contemporary Vampires"
John H. Beckwith holds a degree in research psychology, practices aikido, recently completed a horror novel about thirteen vampires (which still stands on an unnamed publisher's desk awaiting a Y or N response), and is currently working on a novel that is based on Advanced Dragon's & Dungeon's Planescape. Favorite episode: After GIRLS JUST WANT TO HAVE FUN (#28), I'd have to choose DESTINY (#36), because of its hypnotic dialogue, cunning use of flashbacks to smoothly foretell a sad ending, the "We have a stowaway," martial arts choreography, and the emotionally potent imagery of all those crosses along the beach. "Was and Is Xena an Effective Commander?" "Who Was Xena's Father? Theories on the Warrior Princess' Origins"
Native Californian, born 1951 (old for a Xenite, but my 81 year old father is an ardent fan!) I live in the Bay Area and work at UCSF Medical Center, where I manage an oral pathology research lab. I run experiments on human biopsy tissue (mostly cancers) and am primary or co-author of over 30 research papers. I was an art major before I switched to cell biology, but I still love ancient art and mythology. 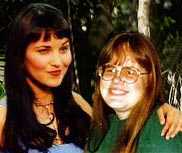 I have never in my life done any fan thing until Xena! Favorite episode: It was IS THERE A DOCTOR IN THE HOUSE (#24) until I saw A DAY IN THE LIFE (#39)! "XENA: WARRIOR Princess Scenes We'd like to See"
Favorite episodes: A DAY IN THE LIFE (#39) and anything with Callisto in it. "A Fan's First Introduction to Fan-Fiction"
Merry Gilmore lives in the N.Y. metro area with her canine companion of four years. After spending major bucks and time obtaining a Juris Doctor, she realized what she had suspected all along: a legal career was not for her. After more career changes than Gabrielle has scrolls, she has found job satisfaction for the moment and is afraid to discuss it further for fear she will start noticing the things she really hates about her job. 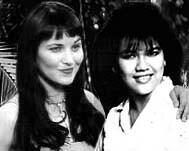 Since a stray glance at a TV while Xena was being wooed by Ares in THE TIES THAT BIND (#20) she has become rather single-minded in her devotion to XWP, believing that "God inspired television so that in the fullness of time Xena could come forth." Her hobbies include: watching XWP, reading WHOOSH!, reading and writing XWP fanfic, checking XWP sites on the web and working on the board game, Xenopoly. She used to have other hobbies, but can't remember why. "Xena and Heathcliff: Classic Byronic Heroes"
Cathy McLain is a displaced Mississippian dwelling in Wisconsin. She majored in English too many years ago to accept, and has written sporadically since then. She presently passes her time working at a small-town newspaper, gardening (in the two months of summer) and wallowing in Xenarobilia. "In Praise of Bards: Missed Opportunities and THE XENA SCROLLS"
"Women at the Convention: A Survey. Part Two: Heterosexual Women"
Rita Schnepp (schnepp@pepperdine.edu) "Four Great Characters in XENA: WARRIOR PRINCESS and CHINA BEACH"
"The Battle of Corinth Part 5 of 6"
BA MA International Relations concentrating in National Security Studies State University of New York At Albany. 1988. Favorite episodes: DESTINY (#36), THE QUEST (#37), and A NECESSARY EVIL (#38). "Changing Times: THE PATH NOT TAKEN and THE RECKONING"
Catherine M. Wilson (Kit) is a software engineer, a lesbian, and lives in a redwood forest in California. DISCLAIMER: No Bacchae were mistaken for the wrong type of vampire in this issue.